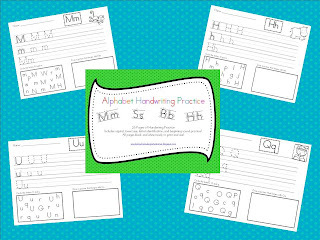 I just jazzied up the handwriting pages I've been using in my classroom for a couple of years using most of KPMDoodles clipart and placed it in my TPT store for $1.50! I love that it gives my kiddos practice in handwriting, letter recognition, and beginning sounds. **They do have a to draw a picture different than the one on the page! :) Just click on the picture below if you want to check them out! I working on some sorting cards as well and a freebie! These are fantastic. I just put you in my wish list to purchase for next year. And . . . what a price . . . THANKS!!! You might find new ideas there!